This story appears in ESPN The Magazine's November 14 Pain Issue. Subscribe today! NFL ratings are down in 2016, and everybody is looking for an explanation. Plenty of theories have been cited: an exhausting election is drawing viewers; off-field incidents and the NFL's treatment of head injuries have sullied the league's rep; and Thursday night games give us ill-prepared teams, adding to the idea that the NFL TV schedule in general is spread too thin. The other theory bandied about: ugly football. The quality of the game being played in the NFL right now simply isn't very good, the argument goes, and that starts with disappointing performances at quarterback. Is QB play in decline? Is the league getting sloppier because young guys like Dak Prescott, Carson Wentz, Jameis Winston and others are asked to play right away? In fact, the evidence says quarterbacks are actually as good as they've ever been. Really. And contrary to popular narrative, the position hasn't gotten easier to play. Quarterbacks are being asked to do more than ever before. Many are sent to the line with two plays and then "kill" one based on their pre-snap read. Others wait until after the snap to pick their play with a run-pass option. They also navigate far more complex defenses after the snap, with defensive backs disguising their coverages and pattern-matching instead of dropping into simple zones or man coverage. They're facing more complex blitzes too, from defenders who are bigger, faster and stronger than ever. On this alone, you would expect a decline in quarterback numbers, but the opposite is true. QBs -- and offenses as a whole -- are more productive and efficient than ever before. Take the Dolphins' Ryan Tannehill. He might be the poster child for the disappointing quarterback of the modern era: a mobile QB with arm strength who struggles to turn those tools into consistent above-average play. He's the guy who, after being drafted eighth in 2012, started too soon and never lived up to the hype -- but he still managed to get a four-year, $77 million extension from Miami in 2015. Even Dolphins fans would argue that he's frustrating, right? 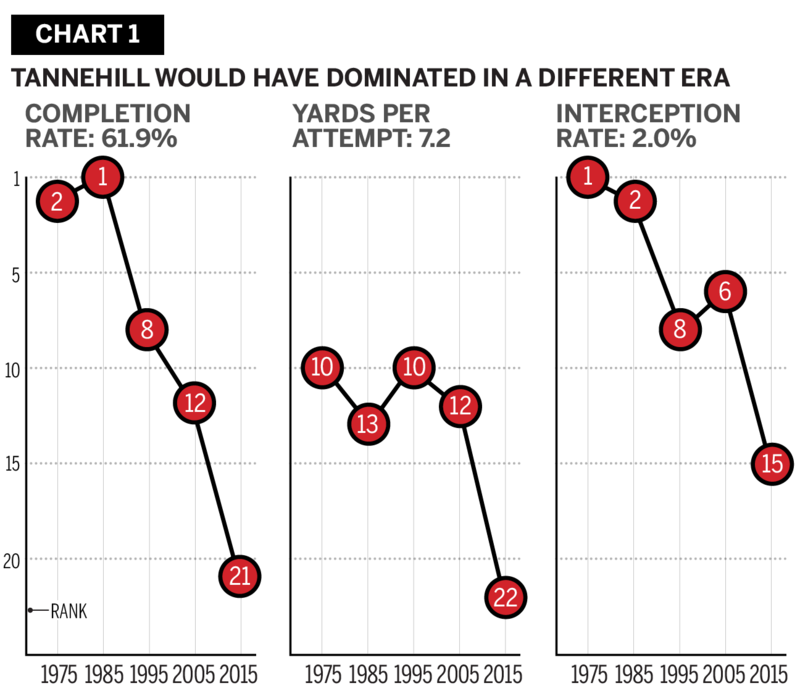 Here's the thing: In any other era, Tannehill would qualify as a superstar. In his 2015 season, widely regarded as a disappointment, Tannehill completed 61.9 percent of his passes with a 2.0 percent interception rate, ranking 21st and 15th in the league, respectively. Those same numbers in 1985? They'd rank first and second. And keep in mind that Tannehill threw the ball 586 times last year-an impressive volume in any season. A quarterback with those statistics and that volume would have been a star in years past, and that's without getting into the value Tannehill contributes as a runner. What's below average today would have been above average just 10 years ago and worthy of Pro Bowl consideration in the 1970s and '80s. If you think the 1985 Bears epitomized a golden age of NFL football, think again. Now, I hear you countering: "But it's obviously easier to pass in today's NFL than ever before." It's true that teams today are throwing shorter passes, which puts an increased amount of pressure on receivers to make plays after the catch. That's fair. But while we don't have data on air yards (the distance a ball travels before being caught or falling incomplete) going back to the 20th century, ESPN Stats & Information did start tracking it as of 2006, and across the board, regardless of throw distance, quarterbacks completed passes more often and threw interceptions less frequently in 2015 than they did in 2006. And what about that sloppy play? We often hear about all the turnovers. Watch NFL RedZone on Sunday and it's one after the other. We see footballs being thrown to a defender without a receiver in the vicinity. We see bad snaps and crippling red zone fumbles. 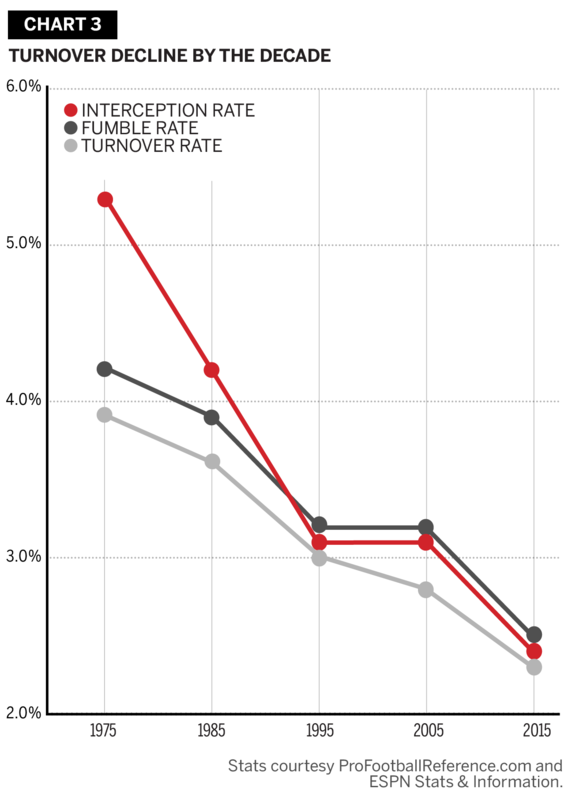 But a declining level of play should mean more turnovers, and again, if you look at the league over time, turnovers of every sort decrease as you get closer to the modern game: A turnover rate of 3.9 percent in 1975 dropped to 3.0 in 1995 and was down to 2.3 percent last year. The anecdotal side of the argument says, "Well, if it's not bad QB play or more sloppy play, it's about the talent coming in. These kids aren't ready to play!" Sorry, but the idea that colleges aren't preparing players like they did in the past is absurd. If colleges were really unhelpful, how could rookie quarterbacks like Wentz and Prescott come into the NFL and excel almost immediately while looking like seasoned veterans? Prescott isn't just winning in Dallas; through Week 9, he ranks third overall in Total QBR at 81.3, behind two MVP candidates (Tom Brady and Matt Ryan). Wentz in Philly? He's completing 66 percent of his passes -- and he came out of North Dakota State, which is further evidence that NFL quarterbacks can be found all over the place, not just at top schools. That's not a new phenomenon, of course. It's just a reminder that there's no QB "crisis" at any level. The QBs aren't the only rookies playing well: Cowboys halfback Ezekiel Elliott, Jaguars corner Jalen Ramsey and Titans right tackle Jack Conklin have been among the best players at their respective positions in 2016. Coaches around the league have argued that the schemes being run in college football don't fit their pro standards, but that ignores how teams like the Patriots and Seahawks have successfully integrated concepts into their offenses rather than relying on crafting offenses around their players' strengths. Think about it: If teams around the NFL really believed that the quarterbacks coming into the league weren't up to the rigors of the professional game, we would see these organizations prefer veteran options like Josh McCown and Chase Daniel in free agency and decline to take passers at the top of the draft. And yet, since the new CBA and rookie scale were enacted for the 2011 draft, eight of the 18 players taken in the top three have been quarterbacks, including each of the top two picks in the past two drafts. 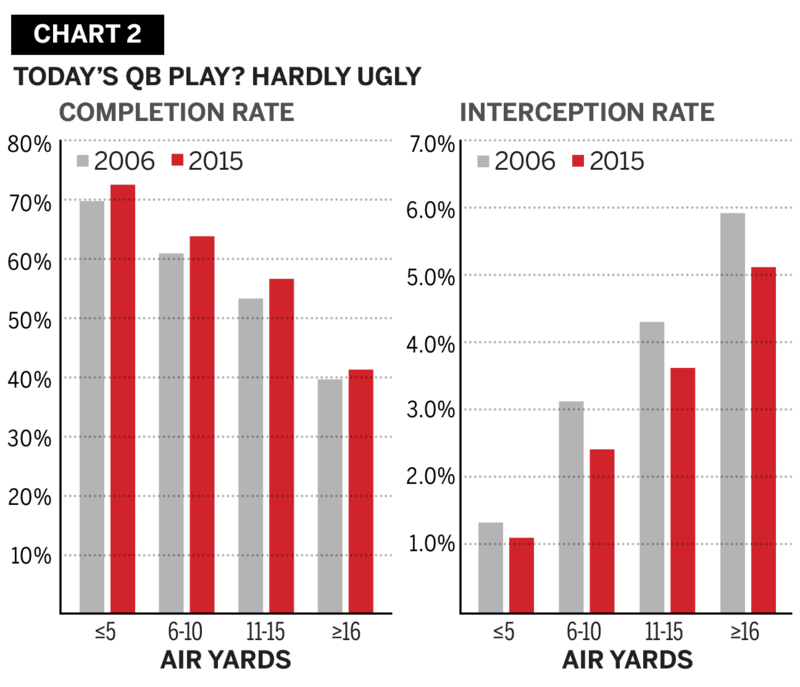 There's scant evidence of a drop in the quality of quarterback play. So why are we having a debate about declining performance around the league? The reality is that we see more football now. We've had access to Sunday Ticket for a while, but the addition of an oft-mediocre Thursday night game presents a disappointing product on national TV. The addition of RedZone doesn't just mean you see every touchdown, it means you see every turnover. Sometimes twice. Just 20 years ago we'd get our game, then maybe Troy Aikman vs. Steve Young in the national broadcast. Of course the NFL looked better when networks picked out the best matchups and you couldn't just flip over to see Jacksonville. "There's scant evidence of a drop in the quality of quarterback play. So why are we having a debate about declining performance around the league?" The league knows it too. As recently as 2011, the NFL was reticent to share the All-22 coaching film that goes out to teams and officials for analysis, with former Texans and Redskins general manager Charley Casserly worrying that it would be used to draw inaccurate conclusions. That tape was made available to the public the following year. The idea that modern athletes are somehow less schooled in the fundamentals is one we hear repeated in every sport, with no real evidence to back it up. But in the NFL, the complaints that quarterbacking is worse now than ever and that young QBs aren't prepared don't just fall flat -- the numbers show the opposite to be true. There are plenty of reasons NFL ratings might be declining. Inferior quarterback play is not one of them.